Our loft aspirations turned to dust. Someone else reached the finishing line before us and we were back to square one. Do not pass go, do not collect £200. This is what happens when dreamy loft lodgings are offered to several letting agents simultaneously: chaos and disappointment run amok. Still, at least our reservation fee was promptly refunded. Decent billets were flying off the shelves at a rate of knots so we rose early to catch the elusive worm, zipping back up the A11 in our borrowed Renault Megane at the crack of dawn. It was a fruitful tour. 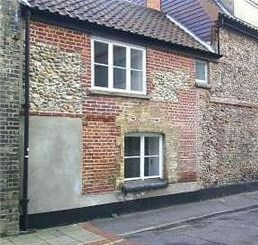 On our first viewing we bagged ourselves a genuine 17th Century weaver’s cottage at the edge of Norwich’s medieval quarter just a short sashay from the action. So, instead of a writer’s garret, I shall be weaving my words in a converted artisan’s flint and brick dwelling dating from the 1640s. Just think, the original weaver first moved into his brand new designer hovel (no mod-cons at the time) when the humourless Protestant Taliban chopped off Charlie Stuart’s head, established the English republic, banned music, closed down the play houses and outlawed Christmas (and let’s not even talk of the unspeakable things they did to the Irish). It’s no wonder the Commonwealth didn’t last; it was so boring. I wonder what Killjoy Cromwell would have made of us? Off with their heads? It sounds lovely. I think you’ll be happy there. Glad to hear things are working out for you both. Thank you. Let’s hope this doesn’t slip through our fingers! I see you blocked the door up to make it harder for the other agents to give any viewings – or is that a local tax dodge ? Shame you lost flat. Considering our homes are the most important and expensive items we invest in you’d think by now we’d have a more civilised way of finding and securing one! However, this cottage with a history sounds great. Shame you have to get in by climbing through the window but then if you are like me after a night on the pop I can never use door keys successfully anyway. You’ll have to invite the TimeTeam in to dig the place up looking for treasure. By the way, I take back my comments on missing “real” weather i.e. storms and torrential rain, although we saw none of it in Cardiff, just the usual mild drizzle. Good luck. Ha. Should’ve realised it’s the tradesman’s entrance. What with it being in industrial cottage of course;) Looks great. Just make sure there are no ghosts in it, first… Ours was definitely haunted! !